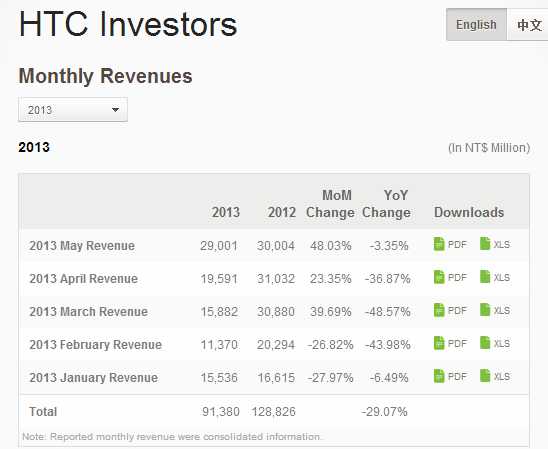 It’s fair to say that things couldn’t have got any worse financially for Taiwan’s HTC after it posted a mere $2.88 million in profit in Q1 2013. But it appears the worst may be over as the phone maker took its first step back to respectability after announcing NT$29 billion (US$ 970 million) in revenue for May 2013. That figure is still 3 percent lower than May 2012, but it’s close to double 50 percent more than the NT$19.5 billion ($652 million) that the company grossed in April and represents its best month of business since June 2012. Update: In news that perhaps overshadows the financial results, Bloomberg reports that COO Matthew Costello has become the latest C-level exec to leave his role. It isn’t clear if Costello was fired or left of his own accord — see below for more on other recent departures, and here for more on Costello’s exit. Yet, despite the increased sales, it remains unclear whether HTC is entirely out of the woods. The HTC First, a handset that was sold on being the first to feature Facebook Home — Facebook’s much talked about Android launcher — is believe to have struggled. Though the firm has provided no sales figures, its UK launch was tellingly postponed indefinitely “following customer feedback” from customers in the US. That disappointment is perhaps unsurprising given that home was released at the same time as the First — giving the device zero exclusivity of the app — while Facebook Home itself has hardly set the world alight. The app clocked 1 million downloads one month after launch — a goal that Korea-only Kakao Home managed in two weeks — and it has struggled to win Android users over, primarily due to the lack of a unique user experience. Poor demand also saw HTC shutter Watch, its movie and rental service, in parts of Europe, while the Taiwanese company is reported to have ditched plans for a large-screen Windows RT tablet. Added to that is an exodus of management that has seen Asia CEO Lennard Hoornik, Vice President of Global Communications Jason Gordon and Chief Product Officer Kouji Kodera all exit the company. There is, however, one ace in its pack: the HTC One. The device has garnered positive reviews across the world and got an endorsement from Google, which announced plans to release a modified version of the smartphone running ‘stock’ Android, the ‘Googleified’ version of Android. The launch will be US only — much to the disappointment of many worldwide — and available for $599 unlocked from June 26. There’s no doubt that the HTC One is an impressive phone but it remains to be seen how strongly it can compete against the Galaxy S4, which became Samsung’s fastest selling smartphone after shipping 10 million units in its first month. The One is said to have clocked ‘around 5 million sales’, and it will be interesting to see if demand for the phone is enough to drag HTC out of the financial quagmire it found itself in just months ago. We’ll see, but going on April’s performance, it is reasonable to expect brighter results this year. Note: The title has been corrected after it initially read that the sales were from April, they are in fact from May. Apologies for any confusion.